This article is intended to illustrate functionality of the Excel Online Web application as part of Office 365. With Excel Online you use your web browser to create, view, and edit workbooks. 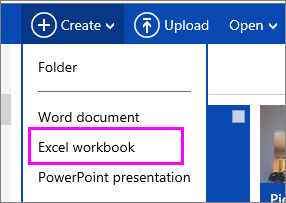 From your OneDrive, click Create > Excel workbook. 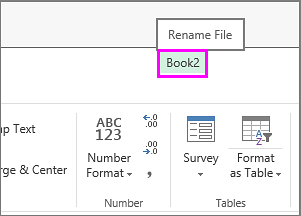 To rename the workbook, click the default file name and type a new one. After you’ve created your online workbook, you can share it. Others can view your worksheets, sort and filter data, and drill into the details of PivotTables on the web or mobile device. To share a workbook, click Share and type email the address(es) of people you want to share with or get a link you can email to your contacts. Click Edit Workbook > Edit in Excel Online. For more advanced editing options, click Edit in Excel. Excel Online saves your work automatically however, if you change your mind about any changes you’ve just made, use Undo or press Ctrl+Z. When you’re working with others in Excel Online, you can edit the worksheet as you usually would. When others edit the worksheet, Excel Online shows their presence and the updates right away. This only works when everyone is working in Excel Online. Select the cells or chart you want to print, and then go to File > Print. To print the whole worksheet, don’t select anything before going to the Print command. Click Print for a preview. 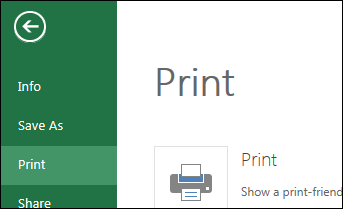 If you change your mind about printing a selected area, choose the Entire Sheet print option and click Print. If the final print preview looks right, click Print.